The Cape offers so many delightful seafood tastes, from shellfish to big, fresh fish straight from the ocean. There is an abundance of restaurants promoting their seafood, and there are also plenty of ways to go about catching your own. Here are some ways to enjoy the bounty of the sea on Cape Cod. At a great sit-down restaurant. There are a plethora of wonderful restaurants all over the Cape, from casual fine dining to sushi restaurants. With so many wonderful restaurants to choose from, it is no wonder that one of the best ways to enjoy the bounty of the sea on the Cape is at one of the many fine dining establishments that abound. Remember though, in the summer it is always wise to make a reservation, so call ahead to your favorite restaurant (or a new spot you want to try) to make sure they set aside a table. 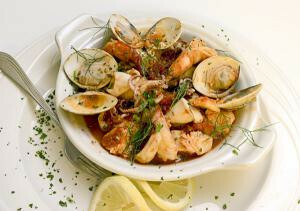 Another plus to eating out at one of the many great sit-down establishments is that you will have experienced waitstaff who can help you understand the seafood offerings and help you pair them with the right wine or beverage. At a raw bar. Of course, if you just want to slurp back a few oysters or clams after a long day on the beach, a raw bar is the way to go. You can order drinks at most raw bars as well, making them the perfect place to cap off an afternoon, or to begin an evening. With a unique twist. Most of the restaurants on the Cape have menus that are available to view online, and a huge plus to this is that you can see all the creative ways they are serving up their seafood. If you are the adventurous type, look around at different menus to see which one has the most eclectic offerings and head out to try something different. Fried up. No seafood list would be complete without mentioning the quick and easy fried seafood, from clam rolls to fried scallops to the eponymous fish and chips. No matter what town you are in, there is sure to be a spot to grab some quick and delicious fried seafood, whether you want it for a pre-beach treat, or for a bite before a night of fun. Catch your own off the beach. If you are the do-it-yourself type, consider catching your own fish off the beach. Doing so requires a permit, which can be obtained online here, at a local licensing agent, or – for saltwater only at the moment – by phone at 1-866-703-1925 (have your credit card ready). For fee information, click here. Fishing off the beach is a great way to spend a day, no matter what the outcome. If you are lucky enough to hook a few fish, then you will have a wonderful dinner. And if fate doesn’t favor you, you can still go out for a great fish dinner after a day spent on the beach. You can also go clam digging, but you need a special shellfishing license to do so. Shellfishing is regulated by the towns, so call the clerk of the town you are interested in going shellfishing in to learn about how to procure a license. There are also restrictions that you need to know before going shellfishing, and those can be found here. The town clerks can also tell you more about the beds that are open (or ones that are closed) and other pertinent information. Catch your own on a deep sea fishing excursion. Deep sea fishing charters are another great way to bring home your own catch. You get to avoid the permitting process and you go out with a captain who knows the waters and where to catch the big ones. Most charters also offer scaling and fileting services, so you can bring home your catch without having to deal with hassle of cleaning it. This is also a great way to get out on the open waters that surround Cape Cod. Make your favorite recipes at home. Of course, if you don’t want to go out fishing, but still want a nice fresh piece of fish made just how you like it, you can always visit one of the local fish markets on the Cape and make your own favorite recipes. Fish markets sell everything from fresh filets to scallops to oysters to clams, as well as lobster and crab, so you can be sure to find everything you need to make a magnificent meal. Your Cape Cod vacation is not complete until you enjoy a delicious seafood dinner featuring locally-caught fish, shellfish or lobster.